Did an Austrian Hobbyist Build a Better 10/22 Receiver? Recently I was browsing my favorite firearms forum and I came across an interesting post by a young man out of Austria. Sebastian, 28, works full time with his small company building and renovating apartments. It's after work that he has time to develop his passion; designing and producing innovative gun parts. 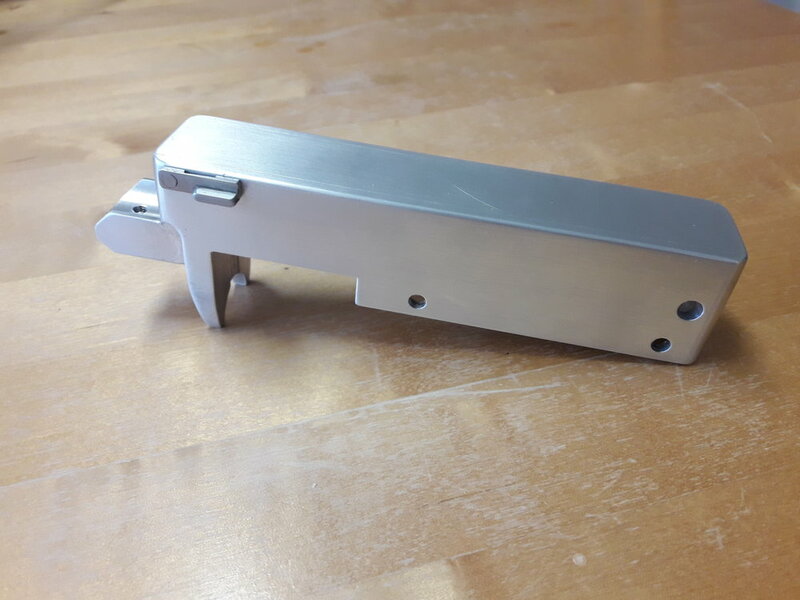 Sebastian (working under the name homegunsmithunger) shared with us a receiver he designed and machined from scratch to solve an issue he had encountered with his own Ruger 10-22. He hated taking it down for cleaning, and found it frequently resulted in damaged or lost pins. His solution was to re-design the receiver into two pieces: the base receiver and a removable top piece, similar in execution to a top cover. This allows the user to remove the top and access the internals in seconds for easy cleaning. Although built in a home workshop with a 50 year old milling machine and a Chinese lathe, it was built to Sebastian's personal exacting standards for both accuracy and reliability. The barrel was made from a take-off Anschutz barrel which was cut to Ruger chamber specifications, and he says the muzzle and chamber were cut to less than .0005" concentricity with the bore line (that's a half a thousandth of an inch). He claims sub-MOA accuracy capability from this combination, and excellent reliability. Sebastian is currently working on several updates and design suggestions, including one with a barrel-mounted picatinny rail and a design that accepts standard Ruger barrels (as opposed to the threaded receiver he utilized in his prototype). The machining is immaculately clean, with clear forethought and careful attention to detail. So what's next for Sebastian? He has a patent pending for this receiver design. Although laws in his country would make it difficult to manufacture, he is hoping to license the receiver to another manufacturing company. His ultimate goal, he says, is to make enough money licensing his designs that he can leave his full time job to follow his passion and develop more complicated projects. He told me he has been contacted by several interested companies and is very hopeful about seeing his receivers hit the American market soon. When contacting Sebastian about this article, he did have one request for me. He maintains several social media accounts to attract attention and share his designs, but he has found it difficult to build a number of followers. If you like this project and would like to see more, please consider following Sebastian on one of his accounts below to encourage his progress. Also, enjoy the gallery of his build photos!